Student will take an Algebra I class in their current 8th grade setting. The class will follow the approved Archdiocese course of study for Algebra I. Student will take two assessments, one in February and one in May at Badin High School. These assessments are created by the Badin High School Math Department. Earning early high school credit will provide the student with more flexibility in their high school schedule. Students will still be required to take four years of math at Badin High School. The resulting score must be 80% or higher in order to earn high school credit. 8th Grade Algebra 1 Unit Test 1 Sign up. The Unit 1 Test covers the first semester of Algebra 1. A list of standards covered and a review packet are available for student use. The review materials should be used as a guide, as exact questions may vary. The test will be multiple choice and scores will be sent to the student's school. Please sign up for one of the two test dates using the Google Form below. 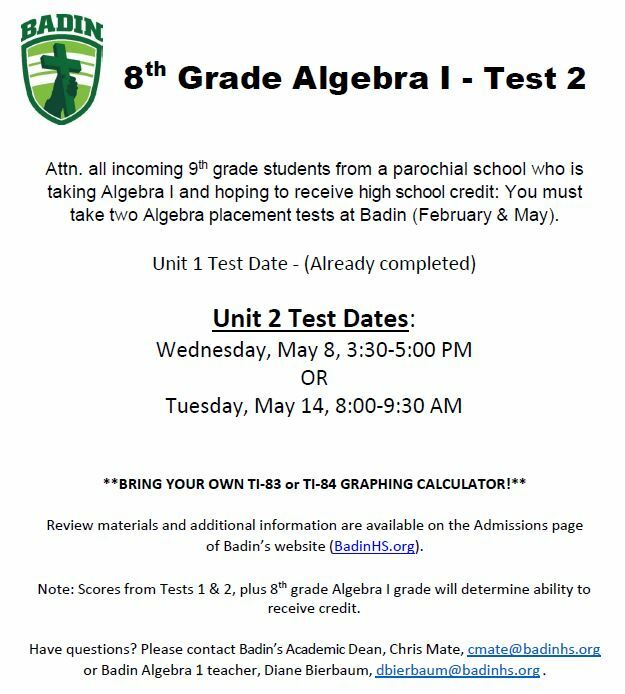 If you have any questions, please contact Badin's Academic Dean, Chris Mate, at cmate@BadinHS.org, or Badin Algebra 1 teacher, Diane Bierbaum, at dbierbaum@BadinHS.org.